Kiehl would determine psycopathy by interviewing prisoners and then rating them 1-3 on a list of 20 attributes. A score of 30 indicates a psychopath. Approximately 20% of inmates were psychopaths. A balanced number of people who rate high and low on the psychopathy scale would be chosen for the experiments. Once the study subjects were put in the MRI, they would be shown pictures of three types: a morally neutral photo (perhaps an ice cream cone), a morally ambiguous photo (perhaps a wrestling match), and a immoral act (perhaps someone placing a bomb in a car). The prisoners would then rate one a 1-5 scale how immoral the picture was. When a person who scores low on the psychopathy scale sees an immoral picture, his limbic system lights up; but a psychopath’s limbic system remains eerily dark. 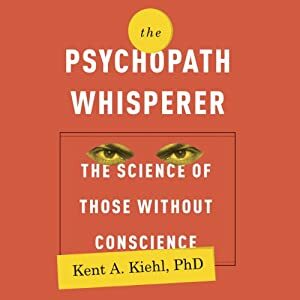 In his book, Kiehl also discusses findings other people have made about psychopaths – like the fact that they have no startle reflex. This mixture of scientific, psychological, and personal narrative make for a fantastic book. I enjoyed this book quite a bit – especially the ethical implications of whether a psychopath deserves an insanity plea because their brains function differently than “normal” people and they are unable to physiologically respond the “right” way to the thought of immoral activity. Kiehl himself longs for a day when psychopathy will be caught earlier in childhood, so that they can receive treatment rather than incarceration. But the issue is quite an ethical dilemma. Where do you draw the line on the insanity plea? I have previously discussed another ethical dilemma of the insanity plea: whether, in a patient with dissociative identity disorder, it is ethical to punish one personality for what another personality has done. Again, where’s the line? And then I wonder about what the neurodiversity movement would say about the whole thing? Things that make you go hmmmm. A thought provoking post as always Rachel. It seems that over the last few years there has been such interest generated about psychopaths. They seem so different from most people, I suppose that it is no surprise that they are so interesting and so disturbing. Yeah, I know. It's had quite the rush of non-fiction books recently (though we've always had a lot of fiction books on the subject). This is actually the only one of those I read – I got it on sale from Audible. Yeah, I heard about that one too. Weird, huh?